All of the racing news is here both nationally and locally. 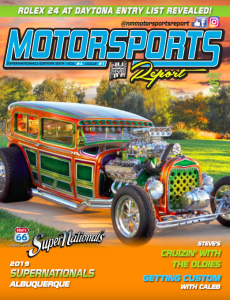 David Swope and Spencer Hill bring you the latest race standings, results, and a look at local motorsport events in Albuquerque. Every race is important for the drivers and teams on the bubble. Spencer Hill and David Swope cover it all just in time for racing this weekend. Spencer interviews sprint car driver Caleb Saiz and you’ll learn about racing events and car shows in New Mexico for this weekend. The NM Motorsports Report airs Friday at 5pm on Proview Sports, Comcast 26. David Swope and Spencer Hill bring you the latest motorsports news, update the race standings and see who is on the bubble. Enjoy interviews with Will Epps from Maverick Auto Fabrication, and the guys talk racing and sponsorships with Sydnee Hamblin the Director of Operations for SEH Motorsports. New episodes of the NM Motor Sports Report air Fridays at 5pm on Comcast 26. Get all of the racing news for this weekend from Spencer Hill and David Swope. They talk about some technological cheating in NASCAR with local driver Jason Irwin, plus look at the local racing events and car shows for this weekend. The NM Motor Sports Report airs on ProView Sports, Fridays at 5pm. David Swope and Spencer Hill cover all of the Memorial Day weekend racing and discuss the schedule for this weekend. Get local racing news and know where the car shows are for this first weekend of June. The NM Motor Sports Report airs Friday at 5pm on Proview Sports, Comcast 26. Kyle Busch punches his ticket to Homestead as a title contender, while Chase Elliott and Denny Hamlin feud at Martinsville. Mike Travers, local Spec Miata and Spec Porsche Boxster racer joins the show. A look at what’s going on locally, including the Drift Christmas event at Sandia Raceway. Skimpy crowds spotted at the elimination NASCAR race in Kansas. Tyler Jones of ESPN Kansas City weighs in. Super Nationals is just a few months away… Why the hype is real, year-round. The tail of two lives… Dave Werth, racer and stuntman, drops by to talk about a daring maneuver… Involving a tail grab. One’s a former champion at UNSR, another is a track champion at Sandia Raceway, and one is a veteran quarter midget racer. The hosts, Dominic Aragon, David Swope and Brooklyn Green, suit up and share their favorite racing memories… All on a Halloween Edition of the New Mexico Motorsports Report. 40 starters, 14 finishers. The hosts break down what happened at Talladega Superspeedway. Steve Torrance is alright, but a scary crash in NHRA racing. Custom car designer Caleb Luce of Luce Customs stops by and talks SEMA, and shares what projects he is working on. Pit reporter Brooklyn Green is back from Charlotte with a breakdown of the NASCAR race weekend. Tony Kanaan will be racing elsewhere in 2018. And professional drifter, Dan Brockett, also known as “Turbo Dan” and “Officer Dan,” stops by the ProView Studios… He talks drifting, stunts and working with Dax Shepard. Dover eliminated four drivers from the NASCAR Playoffs… and Ryan Newman confronts Jeff Gordon on pit road. Our John Haverlin was at the track and breaks it down for us. Heavy hearts as Robert Yates passes away. The hosts share their favorite memories. Co-host David Swope was at Dover International Raceway as well… and stops by ESPN’s headquarters in Bristol, Connecticut. He shares his experience. Larry Pittsley, president of Southwest Motorsports, stops by to talk road racing and how to get involved in it. Joey Logano sent to time out… and we have the pictures to prove it, courtesy of our friend Jerry Jordan at Kickin’ The Tires. The president speaks out about the National Anthem, and NASCAR reacts. John Haverlin of ESPN Radio Albuquerque was at New Hampshire and gave his take on what he said. Brett Moffitt will run more NASCAR Cup Series races… Dustin Albino of Frontstretch.com joins us with more. Legendary local racer Lyle Greenberg stops by to talk local racing and competing on road courses. Albuquerque Dragway hosts the Mopar vs. the World and Uranium Capital Speedway hosts its final race weekend of 2017. IndyCar crowns a champion in Wine Country. Truex is dominant at Chicagoland. Robert Costa of the Albuquerque Dragway and All Out Call Out promoter Mike Taddoni stopped by the show to talk about their event. Roger Green with the Oldsmobile Club of New Mexico, New Mexico chapter, talks about the national event that came to Albuquerque in July. The field is set for the Monster Energy NASCAR Cup Series playoffs. We break down the action from Richmond Raceway. Jeff Gordon stops by the studio… That’s right, New Mexico’s Jeffery Gordon comes on the show to talk about his experience with the name. Al Unser Sr., Albuquerque resident, 4-Time Indianapolis 500 winner and IndyCar champion, comes on the show. You’ve heard us on the radio on ESPN Radio Albuquerque 101.7FM, The TEAM and online at TheRacingExperts.com… Now, we have expanded to television in Albuquerque, New Mexico. The NM Motor Sports Report (NMMSR) debuts with host Dominic Aragon, analyst David Swope, and pit reporter Brooklyn Green. Each week, we break down what is happening on the national scene and locally with an hour dedicated to racing and motorsports, on the ProView Networks (Comcast Channel 26 & ProViewNetworks.com). Throwback week at Darlington Raceway… NASCAR pays tribute to yesteryear. Jim Costa of Yearwood Performance drops by as the first studio guest of the show.